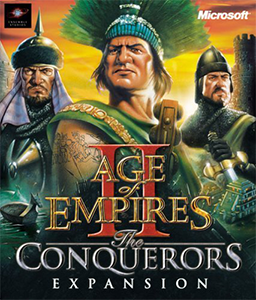 Age of Empires II: The Conquerors is the expansion pack created for Age of Empires II: Age of Kings. If you're unfamiliar with the game, skim over that review first as this one is just about the new features this expansion pack brings to the table. It brings new maps to play on, new civilizations to try out, new units to play with and new technologies to research, among other things. It's not that expensive these days, and in fact you can usually find Age of Empires with the Rise of Rome expansion along with Age of Empires II and The Conquerors expansion all bundled together for under $10. It's a little more expensive to purchase it separately, so I recommend picking up some type of bundle these days. One of the first things you may notice when starting up The Conquerors is the fact that there are new civilizations to choose from. These consist of the Aztecs, Huns, Koreans, Mayans and Spanish. Like the civilizations in the regular game, each one has unique unit(s) available to it. One of my least favorites of these unique units is the Huns' Tarkhan unit; it's a cavalry unit who is good against buildings. I prefer to just stick with my siege weapons for that purpose and the unique unit isn't all that beneficial to me. The Spanish Missionary is a good unit though, as it's more or less a mounted monk. A monk who can travel fast to convert enemies is never a bad thing in my opinion... unless it belongs to an enemy. On the other hand, I really like playing the Huns despite my dislike of their unique unit. Mostly this is because the Huns don't have to build houses to support their population. This makes it easier and faster to churn out tons of villagers at the start of the game, keep setting them to collect food and churning out even more villagers until you're at the population limit for the game. Then you take them all and collect massive amounts of resources for a little while and then send them off to find an enemy and die so that you can free up that population to create an army with your new supply of resources. It's not a huge advantage because houses are cheap enough and quick enough to build, but every little bit helps. It's especially effective if you're planning an early rush against one person, because you can get a much bigger and more advanced army sent over there in the same amount of time and completely decimate them instead of just weakening them severely. Another thing you may notice right away is the fact that there are three new game modes: Defend the Wonder, King of the Hill and Wonder Race. Wonder Race isn't really my cup of tea, but the other two I liked (though I still usually play either Regicide or random conquest). There are also four additional campaigns: Attila the Hun, Montezuma, El Cid, and The Conquerors. The Conquerors is really a series of separate maps that don't really go together, but it's fun all the same. There are also eight new maps, like the Nomad map where players start spread out and with no town center, or Mongolia where there are a ton of cliffs that make it annoying to move around. There are also maps based on real-world locations such as France, Britain, Texas or the Sea of Japan. Some other noteworthy new features are the fact that you can now sail your ships in formations. In the original game you could do this with ground troops, but ships were still unwieldy. If you create a resource depot such as a mining camp, any villagers building it will automatically start collecting nearby resources. Previously they would just stand beside it idle when they were done; now you can send em building somewhere across the map and ignore them because they'll automatically get right to work. There are also new unique technologies to each civilization. These mostly improve one certain type of unit by giving them a bonus like extra range, damage or health. The Goths have a technology that allows you to make units at the barracks quicker, which is handy because they already have a unique bonus of quicker training there as well and the two stack together making for some really fast infantry in a pinch. There are also a few new units in general that are usable by most civilizations; most notably an upgraded pikeman and a new really fast infantry unit that's hard for enemy monks to convert. You can also queue up new farms at the mill so that they're built automatically when a farm is exhausted, which I really like because it's so annoying to try and keep up with them all if you rely heavily on farming for your food income. You can also stick troops inside battering rams now to make them stronger. Graphics and sound for this expansion pack aren't any different than for the regular game that I noticed, except for the new units which are still of the same small but detailed quality and look nice. They also did add in some winter and tropical tile sets which look just as good as the originals. 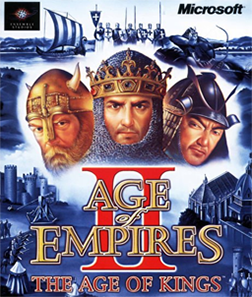 System requirements are identical to the Age of Kings (Pentium 166MHz processor and 32MB of RAM), except that this expansion pack requires an additional 100MB of hard drive space. Overall I like having more civilizations and more units to choose from, and I really like some of the improvements like villagers auto-tasking after building, ship formations and farm queues. If you have Age of Kings you really should get this expansion pack as well since it adds a lot to the game. If you don't have Age of Kings, get it... and then get this expansion pack. Like I mentioned earlier it's really cheap these days and it's a terrific RTS experience. Age of Empires II: Age of Kings is a real-time strategy (RTS) game developed by Ensemble Studios and published by Microsoft in 1999. In addition to the standard Windows PC release, it was also made available for Mac computers as well as the PlayStation 2. Following on the heels of the original Age of Empires game, Age of Kings brings the same wonderful gameplay but adds some much-needed new features like group formations and a button to locate idle villagers. Like its predecessor (and most RTS games), Age of Kings is a game focused on gathering resources, churning out a military and defeating your enemies. This takes place over the course of four ages of the world, starting with the Dark Age, graduating the Feudal Age, then the Castle Age and eventually the Imperial Age. You only have a few buildings and units available at the start of the game and more are unlocked as you progress; most of these will only be unlocked during certain ages. For example, building a Siege Workshop to crank out battering rams is impossible until you've reached the Castle Age. As you may infer from the title, this is a game of kings. You'll find peasant villagers, knights, boats, archers and horses; but no laser rifles or air support. You'll find barracks and archery ranges, castles and marketplaces. Resources you collect are food, wood, stone and gold, and these are the base upon which everything is created. Stone and gold can be gathered from mines spread around the map, wood can be collected by chopping down any trees on the map, and food can be gathered from farms, berry bushes, fishing, hunting animals, etc. You have 13 different civilizations to choose from; these include the Britons, Byzantines, Celts, Chinese, Franks, Goths, Japanese, Mongols, Persians, Saracens, Teutons, Turks and Vikings. Each civilization has between three and five bonuses specific to them. Some are pretty useless like one of the Goth's bonuses is that villagers have +5 attack versus wild boars. That's a terrible bonus that nobody would ever care about. My favorite civilization would have to be the Britons, because one of their bonuses gives foot archers +1 range in the castle age and another +1 range when you hit the imperial age. Archers who can shoot 2 squares further than your enemy's archers is a giant win for me because I always use a lot of archers. Each civilization has another bonus... they can each make a unit unique to them at their castle when they build it in the Castle Age. Some are powerful, like the Persians' War Elephant while others aren't as strong but can be situationally useful like the Celts' Woad Raider. Personally I like the Britons' Longbowman because when fully upgraded it has the best range in the game and can take down towers from just out of range. If I'm playing on maps with a lot of water though, the Viking Longboat is unparalleled. Speaking of maps, there are 13 different map types that you can choose from for a game. Maps are randomly generated, but the topography changes based on the type you select. Want a lot of water? Choose Coastal, Rivers or Islands as your map type. Want a land map only? Highlands and Black Forest sound like a promising choices. Experiment, or if you're not fussy just choose Random and let the computer decide for you. Multiplayer matches are especially fun in Age of Kings, and up to 8 players can play at the same time. There are many options you can set for multiplayer games such as the map size, what technologies are available, population limit, starting age, etc. You can play with a modem or serial connection which are hardly used these days, or you can play with a standard TCP/IP connection. You'll need to do some port forwarding on your router to use this mode with people over the internet, but it works great out-of-the-box for LAN play. I play with one or more of my brothers once in a while on the different computers in the house. The graphics are nice, and a big improvement over the original Age of Empires. They're not spectacular and they're still just two-dimensional, but everything is more detailed and looks cleaner. Units are generally small on the screen but easy to distinguish from each other; you can almost always tell at a glance which unit is which. Colors are a little messed up in Windows 7 though, with pink speckles covering a lot of the land. It doesn't make it unplayable, but it's sure annoying to look at. Sound effects are decent. When you click on a villager you get the standard garbled speech that sounds like words but really isn't like would expect in The Sims. A villager chopping trees makes a sound like an axe into wood, etc. Battle sounds are sword clangs, galloping hooves and cannons and generally sound good. Background music is also decent, but there's not all that much of it. Most of it is just ambient noise, but it works well for the game. System requirements are low since this game is a number of years old now; a 166MHz processor with 32MB of RAM and 200MB of hard drive space will suffice. It still works fine in Windows XP, and also in Windows 7 except for the aforementioned graphic distortion that I experience. I wish it would support a higher resolution, but 1024x768 is as high as it goes so that will have to suffice. Overall a great game, and I highly recommend it. Tremendous replay value (I still play it often despite its age), and you can usually find it in the bargain bin. The Age of Empires + Age of Kings set is usually in the bargain bin even for under $10, so there's no reason to pass it up if you like RTS games.